A concussion is a brain injury common to many sports, especially contact and collision sports. American football, hockey, wrestling and soccer athletes have a higher risk of getting a concussion, but athletes in all sports may experience this injury. Concussions occur in many situations. Athletes may fall and hit their heads against the ground or hit each other directly during sports. 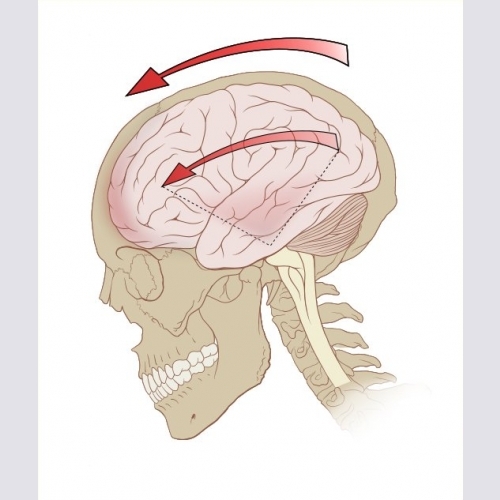 Concussions happen when there is a direct blow to the head, forceful rotation of the head and neck, or both. Symptoms of a concussion can be subtle and may not occur until a few days after the injury. Common symptoms include headache, dizziness, nausea, irritability and difficulty concentrating. Kids and young adults in school might notice that their symptoms become worse when they try to read or do homework. Exercise also tends to make symptoms worse. The force of the injury does not always match the injury severity. Sometimes athletes have minor head injuries with symptoms that last for a long time. It is important to properly diagnose a concussion soon after it happens. A sports medicine physician will ask an athlete questions about his or her symptoms, and perform a careful physical examination. The examination includes testing the athlete’s memory, balance and strength. An examination of the neurological system is performed to evaluate for signs of a more severe head injury. In many concussions, the physical examination is normal, so it is very important that the athlete report all symptoms to the sports medicine physician. Imaging, like a computed tomography (CT) scan, is only necessary if the physician thinks it is necessary to evaluate for head injuries other than concussion. Concussions are serious injuries. Multiple concussions may cause permanent symptoms. Treatment of a concussion involves close medical follow up and time. Rest from sport, exercise, and sometimes work or school is required. Appropriate treatment prevents long-term complications. While athletes involved in contact and collision sports are at higher risk for concussions, proper headgear/helmet fitting and proper sport technique (tackling, for instance) may prevent concussions. Most concussions improve with time and rest. Studies report that concussion symptoms improve in 80-90 percent of athletes by seven days after the injury. It is important to avoid athletic activities immediately after a concussion while symptoms are still present. Athletes should not return to play on the same day of a concussion. Athletes should be evaluated by medical providers for any suspected concussion, and should be re-evaluated prior to returning to their sport. Harmon KG, Drezner JA, Gammons M et al. American Medical Society for Sports Medicine Position Statement: Concussion in Sport. Br J Sports Med. 2013 Jan;47(1):15-26. McCrory P, Meeuwisse WH, Aubry M, et al Consensus Statement on Concussion in Sport: the 4th International Conference on Concussion in Sport held in Zurich, November 2012. Br J Sports Med. 2013 Apr;47(5):250-8.